Once inside, the Welcome Home Doggie Dance begins. Coco and Sophie take turns jumping up on each of us. Lobo does his 3-legged bounce and belts out yips that sound like a house alarm. Lisa squats down. I sit on the floor. Then suddenly, the dance stops and the sniffing commences. Every inch of our bodies are sniffed. This is the point where Lisa and I begin our confessions. "You smell the other pups and kitties? Mommies visited a shelter to deliver biscuits. Yes, we pet other pups. It's okay we do this. They don't have homes or parents. They get sad and lonely." "Sharing the biscuits and spending time with the pound pups makes them happy." "No, we're not bringing home a brother or sister. Three is enough. We promise." "Yes, a couple of the pups gave us juicy kisses. That's their way of saying thank you." "Yes, there are plenty of biscuits left for snack time." 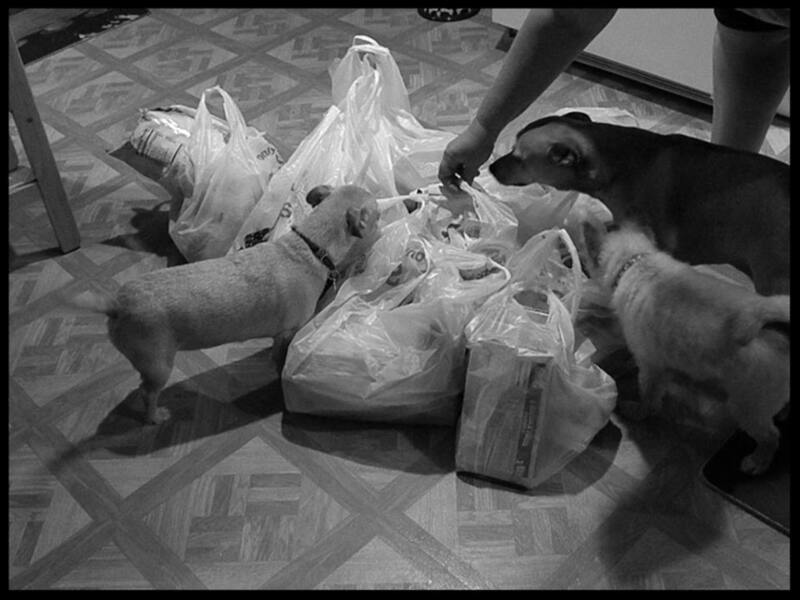 Once the sniff down is complete, the kids move to the grocery bags. Lisa and I stand up. Snap, crackle, pop goes the knees. We stretch. Wait. And wait. After a few minutes, the kids scatter to various rooms to find their favorite toys and plop down on a bed or pet pillow. It's their way of letting us know all is good. We can proceed with emptying the grocery bags and making dinner.